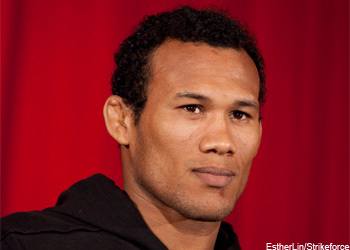 According to Ronaldo “Jacare” Souza, he will defend his Strikeforce middleweight title against Robbie Lawler on a yet-to-be announced January 29th card inside the HP Pavilion in San Jose, California. Jacare announced the scrap during “Jungle Fight 24” on Saturday night in Rio de Janeiro, Brazil. The Brazilian won the open middleweight crown in his last outing at “Strikeforce: Houston.” The 31-year-old took a unanimous decision win over Tim Kennedy to capture the belt vacated by former king Jake Shields. The jiu jitsu wizard owns a 13-2 record overall, with 10 of his victories coming by way of submission. It took Lawler all of 50 seconds to dispose of veteran Matt Lindland at “Strikeforce: Henderson vs. Babalu 2” earlier this month. The former EliteXC 185-pound champ has ended 15 of his 18 wins via some form of knockout.